Texas based beach music featuring songs about the Gulf Coast from New Orleans to Corpus Christi. 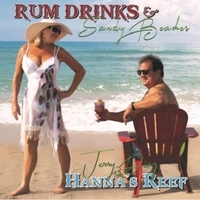 "Rum Drinks & Sandy Beaches" is the 5th CD from Southeast Texas based artist Jerry Diaz & Hanna's Reef. The CD features more of JDHR's signature Texas Beach Music, with lyrics that take you right down to the Texas coast, SW Louisiana, and their home-away-from-home, New Orleans. The album was recorded and engineered by longtime Lost Gonzo Band stalwart John Inmon, and at times the listener may feel like they are tapping into early Jerry Jeff Walker, or vintage Jimmy Buffett. A couple of blue chip guest musicians from the Austin scene, including Richard Bowden (Ryan Bingham band) and David Webb (JImmy Lafave) add to Inmon's scorching guitar work throughout the album. With a heavy dose of beaches and alcohol, the aptly named CD once again delivers what JDHR's fans have come to expect.